There may have been changes at Mountain Goat in the six months since Asahi moved in, but one thing that hasn't changed is their love of brewing hearty American IPAs. It's something they've done with panache since the very first Rare Breed release many moons ago, since when there have been black, red, coffee, more black, Japanese, double, black again and no doubt other IPA variants we've forgotten. And now, hot on the heels of the Japanese Cowboy, comes The Zymurgist. A glance at the ingredient list suggests it shares a little in common with the brewery's past Bubble & Squeak beers – those that cast an eye around the store room and made a concoction of whatever the brewers could find. At least, that's what we take from a roster of hops that tours the world, collecting Simcoe, Columbus, Cascade, Centennial and Amarillo from the States, Polaris from Germany and Super Pride from Australia. The zymurgists at Goat set them against some reasonable weighty malts from New Zealand, yet not weighty enough to distract from the hops. There's some sharp citrus and pine alongside some malt sweetness in the aroma and then a veritable shopping list of hop characters awaiting when it hits the palate: grapefruit, pine, resin and a broad, building bitterness. 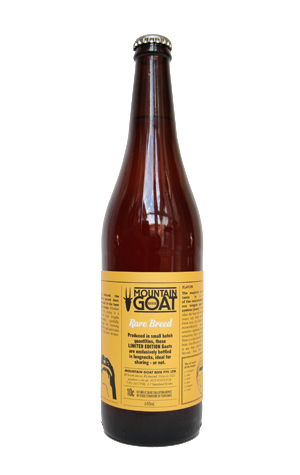 Their core range IPA may have been abandoned, with the pasteurised packaged version not living up to the quality of the draught one, but as long as they keep knocking out Rare Breeds like this, Goat fancying hop fiends will be happy enough.